Will Lesh, Tippecanoe Boats designer and trans-Atlantic sailor. Tippecanoe Boats was founded by Will Lesh in 1983. Over 70,000 boats have been built in the past 36 years. Support for the company has been tremendous. Many people grew up with beautiful wooden pond sailors and have been unable to find a really fine model sailing boat until they found Tippecanoe Boats. One person told us that he had woken up one night with a dream of sailing a beautiful model boat on a beautiful lake. He climbed out of bed, got on the Internet and found nothing. Fortunately at about 10:00 am. he happened to discover us purely by chance at a retail art show that we were doing that same morning. That story happened shortly before we launched our web site. No other company produces the fine sailing and traditionally elegant boats that are the hallmark of Tippecanoe Boats. We believe that every boat that leaves our shop in WA State is a boat that we would be proud to own ourselves. In other words, every boat should be perfect. It is our mission that every boat should sail beautifully and fast, and provide hours of fun and excitement. We build all of our splendidly crafted boats at our small shop in the foothills of the North Cascades, north of Bellingham, just 5 miles from the Canadian border. An hour to the east are the spectacular hiking trails of the North Cascades National Park and the Mt. Baker National Park, thousands of square miles of pristine wilderness. 40 minutes to the West lies Puget Sound, where from our hilltop we see the scattered array of the San Juan Islands. We can pick out our favorite cruising destinations as we look out over our shop buildings. The wonderful tradition of beautifully crafted wooden model sailboats has come down to us over the past 150 years. Although the earliest model boats have been found in the pyramids of Egypt, these may not have been actual sailing models. However, we can guess that children of the period had similar model boats to float along the banks of the Nile! Real sailing models that sail the same as full size boats became truly popular in the mid 1800's. Many of these beautiful boats were hand carved and lovingly rigged to look like the full sized boat that they were based on. 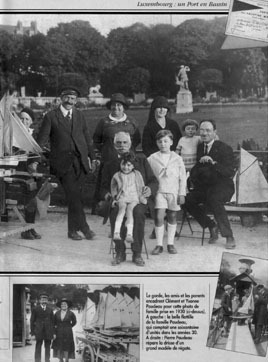 By the early 1800's, the sailing ponds in Paris had become famous with their model boats which visitors to the parks could rent. When Frederick Olmstead was designing Central Park in the years after 1858, the Paris sailing ponds became the inspiration for the center piece of the park, the Conservatory Waters model sailing pond. 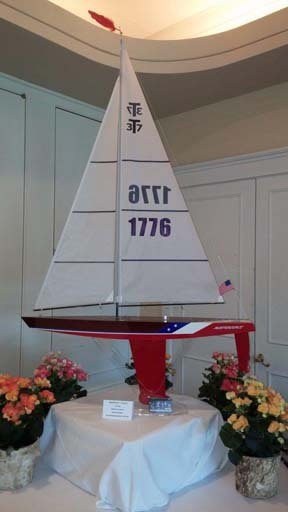 The adventures of the sailing models the Wasp and the Lillian B Womrath on Conservatory Waters are immortalized in E. B. White's classic story "Stuart Little". The crowd watching the race between these two miniature yachts becomes so excited that the policeman trying to hold the crowd back loses his balance and topples over backwards into the pond. The Jacrim Seaworthy model sailboats produced by Chester A. Rimmer, "MIT graduate and Naval Architect", thrilled thousands of adults and youngsters (myself included) with their realistic sailing performance and sleek elegant wooden hulls. In England, the Star Model Boats of Birkenhead became well-known, produced by a ship-building family that fled from Belgium by launching one of their nearly completed trawling boats as the Germans approached during the early days of World War I. Landing in England, the family needed employment. The husband assisted with the war effort by working in shipyards, and then after the war ended he began producing model sailboats that became iconic toys for children around the world. The Jacrim-Seaworthy Keystone model yachts and the Star Model boats are no longer produced. The Keystone boat company disappeared in the late 1950's. The Star Boat Company shut its doors at the end of the 1900's. We take our role seriously as the only remaining company producing truly magical and excellent sailing model boats. Initially we offered our splendid 18 inch T-Class Racing Sloop. There are now over 18,000 of this size model sailing that we have produced. 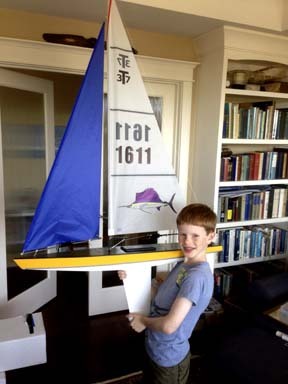 Next we added the 15 inch boat, originally called the T-Class Junior and later redesigned as the T15 Racing Sloop. Last to join the fleet was the T12 Racing Sloop, now one of our favorites. The key to these traditional model sailing boats performing so well is the heavy keel casting on the bottom of the keel plate. The keel casting keeps the boats upright at all times and allows them to perform beautifully even in strong, gusty winds and big waves. 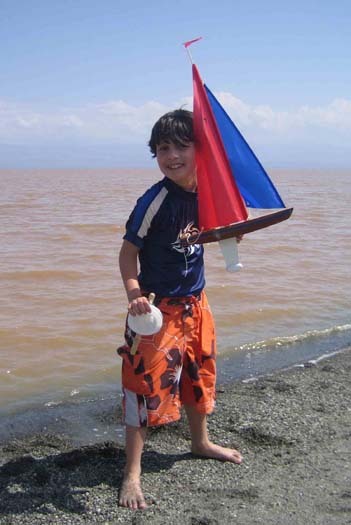 In 1990 we began experimenting with our early radio control model yachts. Radio control gear had become affordable and reliable. The new gear was all "digital proportional" which allowed precise control of the rudder and the sails. By moving the control stick on the transmitter a certain distance, the servo would respond by moving a proportional amount in the boat. Move the control stick farther and the servo would move the same distance farther. Our first radio control model was our T32 which was a hollow, hand-carved cedar hull. Sony Records purchased one of these beautiful sailing models to present to Shania Twain in 1995 to celebrate her winning the Grammy Awards! Over the years we have developed some of the most sophisticated radio control yachts in the world including incredibly light infused resin carbon fiber hulls. The hands down winner in our radio controlled fleet, however, has always been our 37 inch T37 Racing Sloop. With over 3000 now sailing, the T37 ranks as one of the largest radio control classes in the world. Our mission is to continue the wonderful tradition of model sailboats, especially wooden model sailboats, that really sail. Our boats have provided thousands of hours of happy outdoors experiences for countless adults and youngsters. We hear back from owners almost every day about how much they enjoy their boats and how pleased they are that we are doing what we do. 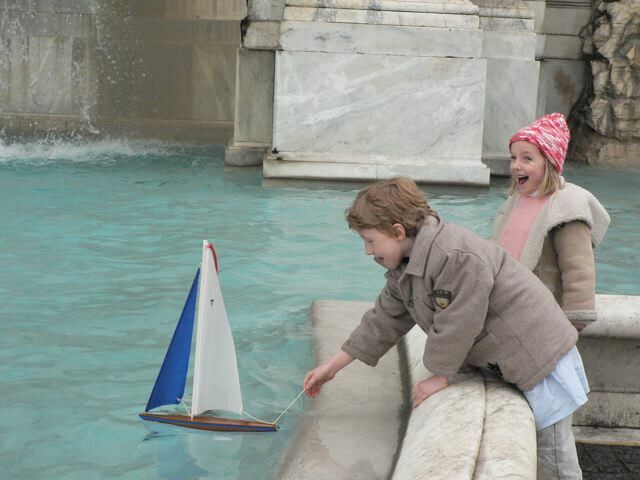 In their small way, model sailing boats make the world a better place for all of us.